The 9th of mars 1975, this station popped up. They had no own transmitter, so they have to borrow other Scandinavian transmitters, for example Radio Poseidon International and Baltic Sound. DJ’s 1975 was Wim de Roy and 1976 Phil Player. 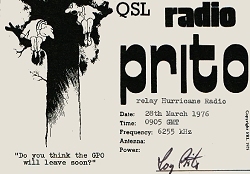 A man called Ray Prito was noted as verificationsigner. The last time this station was logged was the 28 mars 1976.